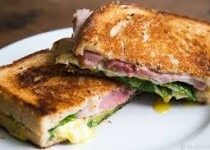 A great way to add flavour to your traditional grilled cheese sandwich! Garlic Scape& Kale Pesto - 1 Tbsp. Salt (or to taste) - 1/4 tsp. 1) Heat a couple teaspoons of butter in a small stick-free pan on medium heat. When the pan is hot and the butter foamy, crack the egg in the pan. Cook the egg until the whites are cooked and it is still somewhat runny in the yolk (or not runny at all if that's what you prefer), and remove the egg from the pan to a plate and set aside. 2) Heat a cast iron pan or griddle on medium high heat. Spread some butter on one side of one sliced of rye bread. Place the slice butter side down on the pan. 3) Spread half of the Garlic Scape Pesto on other side of sliced rye bread. Add a layer of ham on the bread. Add a layer of spinach to the ham. Place the egg on the spinach. Top with a layer of cheese and spread the other half of Garlic Scape Pesto on the second slice of rye bread. 4) Spread some butter over the top of the top slice of bread. 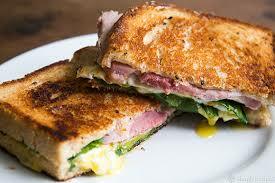 When the bottom slice is nicely toasted, use a metal spatula to carefully flip the sandwich over to the other side. You may need to use your hands to help the flip happen without everything spilling out. If the ingredients do spill out a bit, just gently edge them back in. 5) Press down with a spatula to help get the heat to the cheese. Cook until toasted on this second side. Remove from pan, cut in half, and eat! Option: Do not have time to make garlic scape pesto, try our NEW Garlic Scape & Kale Pesto!